Adventures in Kindergarten: Educator Appreciation Week - 25% Off! Educator Appreciation Week - 25% Off! On Friday I had a horrible, terrible, no good, very bad day. The kind of day where you leave the house at 6:15 am and get home at 8:45 pm. NOT on purpose. NOT because you were doing something important or fun. Because you worked until 3, tutored until 5:15 and then sat on the on-ramp to the highway for 25 minutes not moving. Now when I say "not moving" I do not mean that traffic was stop and go. I mean that I literally DID NOT MOVE. I sat and sat and sat until the people behind me started doing crazy u-turns, then I did a crazy u-turn too. Then I took a wrong turn, accidentally went the wrong way on a one way and got completely lost. When I found civilization again I went to Old Navy, finally found one pair of pants that were not heinous, then started the drive home again. Traffic was still excruciating, as in 14 MPH in a 65 excruciating, but at least it was moving! Come to find out that not only was the first Red Sox home game letting out, every single runner in the Boston Marathon was picking up their bib and all that jazz. Plus everyone was getting out of work. All of those combined equaled the worst traffic I have ever seen in my life! 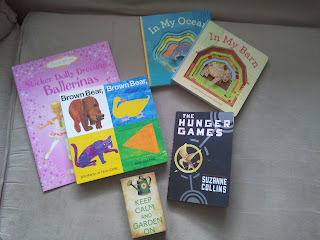 Here is what I picked up: A ballerina activity book for my niece's birthday, a super cool Brown Bear sliding board book for a friend's baby, In My Ocean and In My Barn for my classroom (I already have In My Den and In My Pond and my kids ADORE the colorful illustrations and fun finger puppets), The Hunger Games for myself and this Keep Calm and Garden On decoration thingy for Mother's Day. The total came to about $45. 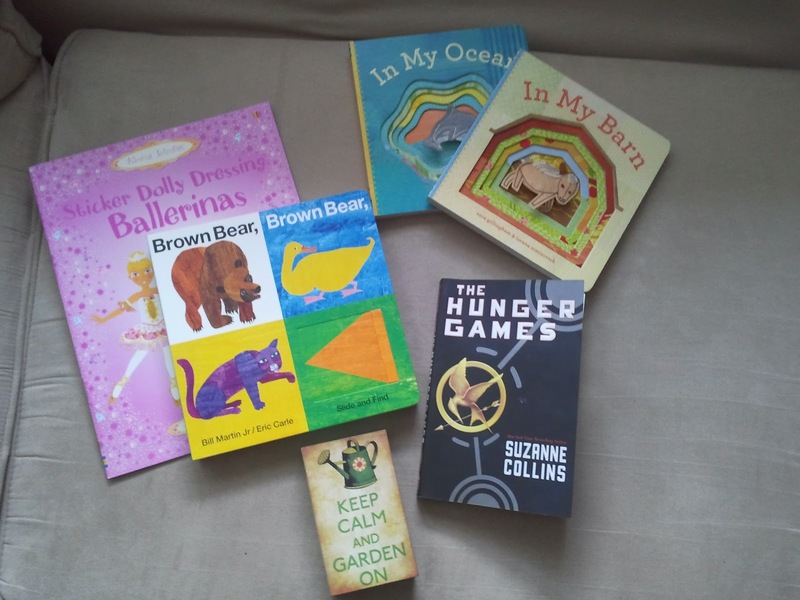 And here are all of the magical freebies I scooped up! 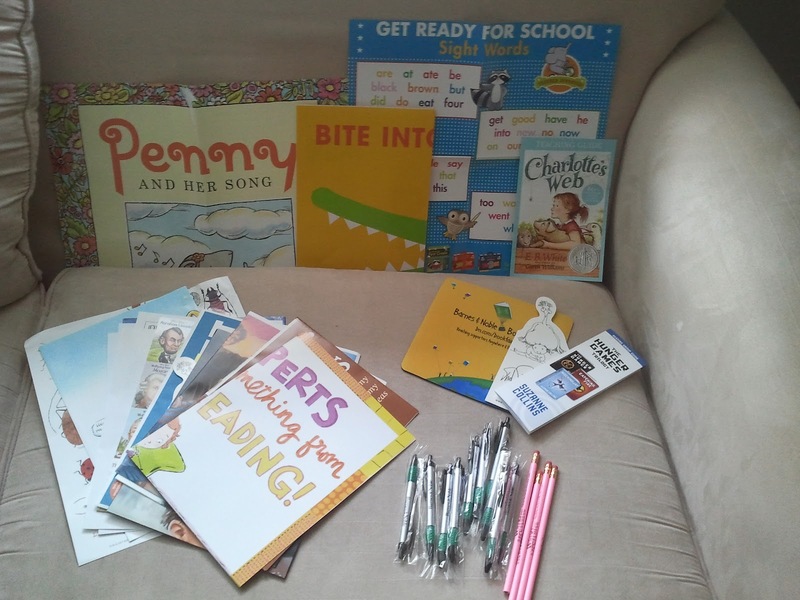 Some of my favorites were a Kevin Henkes poster, free pens and pencils, a Shel Silverstein bookmark and a Charlotte's Web teacher's guide. There are tons of other fun book posters and reading guides too. I highly suggested you walk run down to Barnes and Noble and grab something fun for your classroom or yourself! *Note: I have absolutely nothing to do with Barnes and Noble... I just LOVE a good deal! Don't you just love when good things happen! :) I'm a new follower. I teach title 1 math k-3 and am always looking for new ideas for kindergarten. As far as my favorite sites, I do a lot of mundane stuff on line because I travel so much.